After our first conversation, I knew that Kyle would be a fantastic addition to our speaker line-up, and serendipitously, everything fell into place to enable Kyle to participate. Kyle had suggested having these kind of conversations would be ground breaking, and that is exactly what took place. Kyle was a part of a panel on inclusivity, that many people who were there said was one of the best speaker panels they had ever witnessed. From an athlete perspective – how many races actively outreach and encourage participation by athletes with a perceived physical limitation? 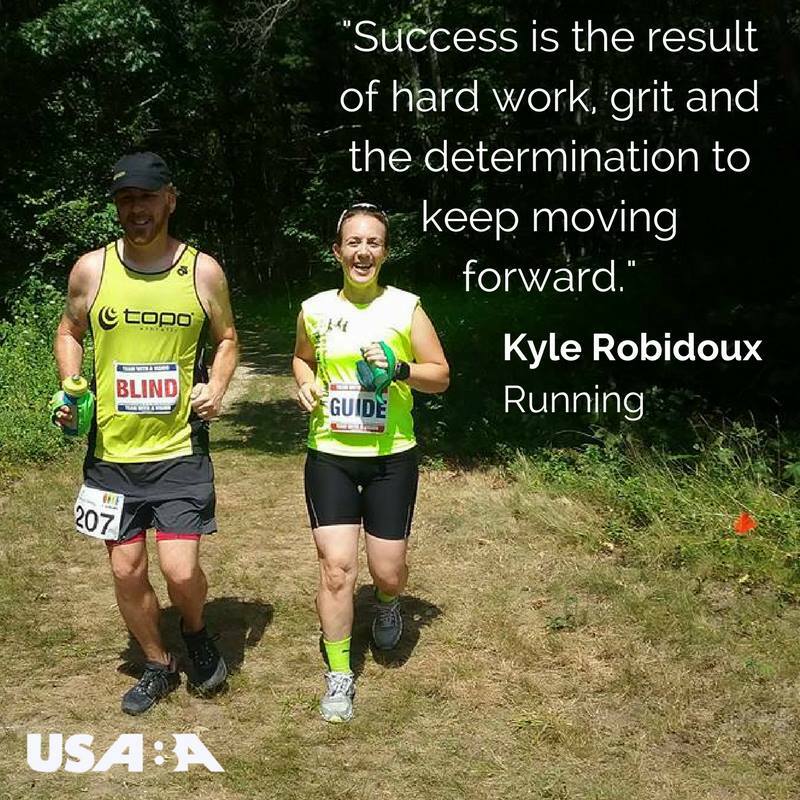 On United in Stride we list about 25-30 races that have either a Visually Impaired and/or Athlete with Disability Division, about six or seven of which are trail races. That said, we know there are a few more races that are inclusive out there. But advertising a specific division is incredibly helpful. Most recently, the Chuckanut 50k created a Visually Impaired Division and will also offer prize money if there are three or more runners who are blind/visually impaired. We believe this is the first trail ultra to offer prize money. Do you have any advice for trail race directors on managing or creating new athlete divisions? It takes very little time to set up a basic VI/AWD Division. A few guidelines regarding using guides, offering an early start if desired and depending on how crowded the race is, adding a drop-down menu on your race registration page so the RD can track and contact participants. There is a resource document on the United in Stride website to help RDs (http://www.unitedinstride.com/vi-division-race-directors), and staff can also provide technical assistance. What can races do more of that they are not currently doing to be inclusive? It is not about anything that races and RDs are not doing, but more about building awareness. Most of the RDs we interact with, especially trail and ultra RDs, are incredibly open-minded and great to work with. But having the mindset that it will take a bit more work/effort to ensure that runners have the same opportunity as others. For example, the Race SLO race staff were incredibly helpful with me wanting to run their 50k. In trying to figure out where to transition my guides, they were kind enough to put together a map with a few options. This takes time but is important if you want a diversity of race participants. I also think some RDs are concerned about liability but every runner who is blind/VI is willing to sign the same waiver as others runners as are our guides. One very small step is to simply put a sentence or two on your race page advertising a contact person for any runners who athletes with disabilities or would like to discuss race accommodations. This will make any athletes with a disability comfortable knowing that the race is supportive and they are reaching out to an actual staff persona and not a generic info@trailrace.com address. What are the restrictions for trail races and what can be done to provide more opportunities? I think having conversations like the one at the U.S. Trail Running Conference will have a tremendous impact. On a practical/logistical level, when conducting outreach and marketing efforts, include groups that support athletes of all abilities. In addition to the local running clubs and stores, reach out to organizations like Team Red, White, and Blue and Achilles International, which have chapters all throughout the country, to see if any of their members want to run your race. Invite them to make a short speech during your pre-race meeting/dinner about their program. Be flexible with your race guidelines. Yes, you want to uphold the integrity of the race and make sure that it is safe for everyone who is on the course. But be flexible. If your race does not permit trekking poles, be open to allowing poles for a runner who is an amputee or visually impaired. If your race has strict crew vehicle limits be open to allowing an extra car or access to a non-crew aid station to help transition guides on and off the course. For races that do not have lotteries and fill up within minutes, offer runners who are blind/VI the opportunity to register early because there is no way we can complete the form on time. Finally, there is an RD resource guide on United in Stride. I am also available to consult with RDs to set up a division that works best for them. What do you look for from a guide, and what can someone who is looking to be a guide to a VI / blind runner expect in terms of their experience? As long as a runner knows their lefts and rights, they are in a good position to be a sighted guide! Guides need to be strong communicators, be able to process information quickly then verbally communicate that information to the runner they are guiding. Ideally, guides are able to run a faster pace than the runner they are guiding so they can comfortably talk and physically hold up over the course of the run/race. For example, if a runner who is looking to run a 24-minute 5k, their guide should be able to comfortably hold a 7:30 min pace. 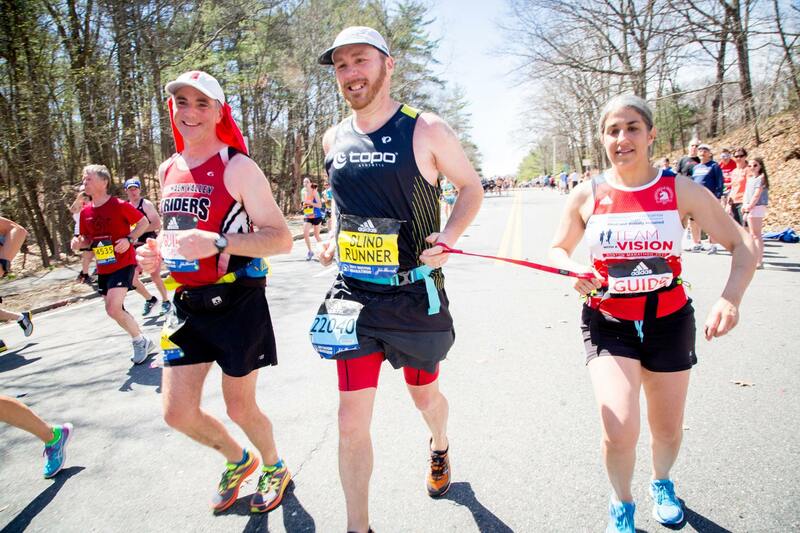 Similarly, if a runner who is blind/visually impaired wants to run a 4-hr marathon, they will be matched with a guide who can comfortably run 3:30. Recruiting sighted guides continues to be the biggest barrier to individuals who are blind/visually impaired getting outside and being active. Throughout the country, there is a need for all paces (including walking) and distances. The United in Stride website has a sighted guide training video for new guides and runners. Additionally, we recommend starting out on a smooth surface (possible a track or nice and wide running path) for a run or two then progressing to the trails from there. Since the 2018 US Trail Running Conference, several Race Directors have decided to add VI divisions to their existing trail races – reports on those to come! Kyle has also bagged a place at the 2019 Western States 100, becoming the first VI runner to toe the line at this grueling race. See more on this exciting news at this Runners World feature. 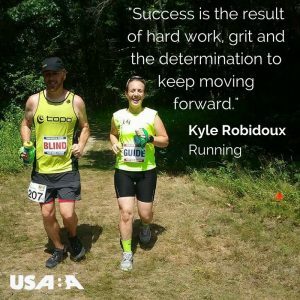 We wish Kyle every success with his mission to raise awareness for VI and blind runners! 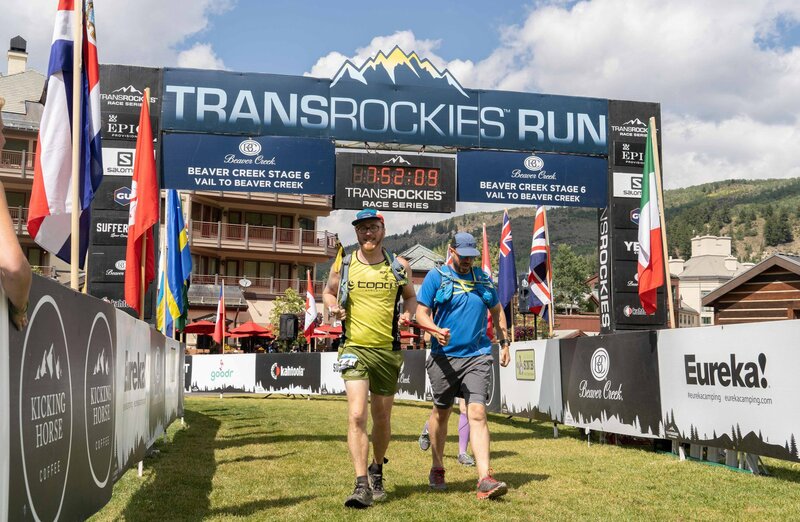 Registration for the 2019 US Trail Running Conference is open – see details and to register at this link. The Conference is Presented by Race Roster, the fastest growing endurance registration platform in North America. 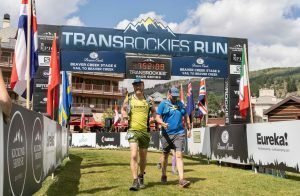 The event is held in partnership with the American Trail Running Association, and is organized by Active at Altitude. This entry was posted in active at altitude, blind runners, chuckanut 50k, craig thornley, kyle robidoux, race slo, san luis obispo, trail race directors, trail running conference, united in stride, visually impaired, western states 100 and tagged blind runners, chuckanut 50k, kyle robidoux, race slo, trail conference, united in stride, visually impaired runners, western states 100. Bookmark the permalink.